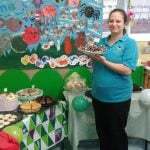 Friday the 29th September saw Little Pips Nursery on Lowden Avenue hold their annual “Big Coffee Morning” for Macmillan. The staff and children came together to bake cakes and biscuits to go along with tea and coffee, with Shannon Green from the Preschool room being named “star baker” for the second year on the trot! Many of our parents came along and joined us making generous donations to a worthy cause. Those who couldn’t make the coffee morning bought cakes to take away, and lots of cake and coffee were consumed during the event. We also ran the “Guess the Height of the Cake” sweepstake, which was won by Dylan Russell, congratulations to him! We are proud to say that we made over £120 for Macmillan. A big thank you, and well done to everyone! This entry was posted in homepage and tagged coffee, fundraising, macmillan, nursery. Bookmark the permalink.